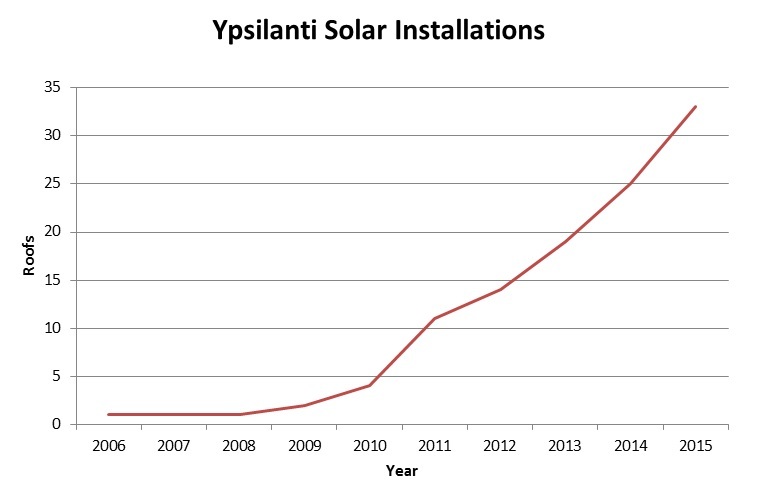 2015 was another record year for solar installations in Ypsilanti with 8 new locations. Most of these came from our wonderful anonymous donor who funded solar projects on six non-profits in town. These locations included the Ypsi District Library, Parkridge Community Center, Ypsi Senior Center, Washtenaw International High School (WiHi), the Corner Health Center, and the Ypsi Department of Public Services (DPS on Forest). Add to this a couple of residential solar installations, and we’re climbing our way to a 1000 solar roofs. location on the north end of town in the Highland Cemetery. So far, everything is on track for this project to start in the spring. The Mott Foundation funded a report looking at the state of renewable energies in the State of Michigan and Ypsilanti was one of seven communities they investigated. The report showed that Ypsilanti had the most solar installations of all the communities! You can see the report here. Eastern Michigan University continues to send students to learn about solar power first hand and several term papers have been written about solar power in Ypsilanti. The SolarYpsi.org website continues to grow with a total of 63 locations on the website. If you haven’t seen the aerial videos that Cameron Getto has been putting together, you can check them out here. They are amazing! SolarYpsi gave 17 face-to-face presentations in 2015 reaching another 282 people first hand and answering questions. These included one-on-one meetings with home owners and large events like the National Solar Tour and the annual Michigan Energy Fair. Ypsilanti now has 173,635 watts of installed solar power or (173,635/19,809) 8.7 watts per capita. While this is still a tiny number, if we add in the proposed 800kW solar installation at the cemetery we’ll have (973,635/19,809) 49.1 watt per capita. If we can get a few more watts installed, we’ll be one of Environment America’s Shining Cities with over 50 watts per capita. The only sad news this year was that our long time developer of the SolarYpsi.org website is moving on to new opportunities, and we need to find a new web developer. 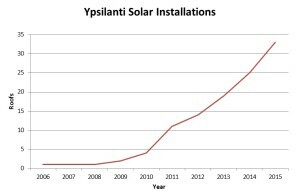 Here’s to another banner year for solar power in 2016 bringing Ypsilanti closer to becoming a Solar Destination! Here is a short review about books about solar power that are available at our local library. 230 pages published in 2001. This book is a bit dated, but looks like a fun read. 178 pages published in 2006. This book is more up to date and cover more that solar power including biofuels, wind wood, and conservation. 255 pages published in 2009. This is a great book to learn about solar electricity. Lots of details and also covers energy conservation. 198 pages published in 2010. Another good book about solar electricity power. 158 pages published in 2005. This book is specific to grid-tied solar electric power, which is exactly wjhat we need in Ypsilanti, however being published in 2005 the information is a bit dated. 366 pages published in 2008. This is a classic “for Dummies” book and very nuts&bolts about adding solar power to your home. 196 pages published in 1984. I didn’t actually check this book out, but it sounds a bit more technical, and being published in 1984 the material is a bit dated. 32 pages published in 1991. This is another book that I didn’t check out, but it comes from the Youth selection and only has 32 pages. This might be a good book to get the very basics about solar power. 32 pages published in 2004. This is another book from the youth section of the library and give a nice summary of the basics of solar power. If you enter “solar power” in the search box, you’ll come up with 57 items. The local library is a good place to start if you want to learn about solar power. I’ll be returning all the solar books I checked out tomorrow, so they will be available soon. An anonymous donor has selected six Ypsilanti non-profit organizations to receive 5KW solar power installations on their rooftops. Earlier this summer the donor contacted SolarYpsi, wondering how to support renewable energy. Volunteers at SolarYpsi suggested finding local organizations that have buildings suitable for a 5 kilowatt solar installation. From a list of Ypsilanti organizations, the donor selected these six: Corner Health Center at 47 N. Huron Street (www.cornerhealth.org), Ypsilanti Senior/Community Center at 1015 N. Congress (www.ypsiseniorcenter.org), Parkridge Community Center at 591 Armstrong, the Michigan Avenue branch of the Ypsilanti District Library at 229 W. Michigan Ave, (www.ypsilibrary.org), Ypsilanti Department of Public Services offices at 14 W. Forest, and Washtenaw International High School at 510 Emerick St (www.wihi.org). Arbor, which offered an average install price of under $3 per watt. All work is expected to be completed this year. Donating money for renewable energy is a great way to support an organization. By giving funds directly to the organization, with quotes already in place, there is zero administration overhead. The solar power will significantly reduce their operating budgets, so the organization can focus more resources on the good work they do for the community. It’s the gift that keeps on giving–for30 years! These installations also help Ypsilanti move closer to its goal of 1000 solar roofs by 2020. To date Ypsilanti has about two dozen solar installations, with at least another dozen installations happening this year, including these six. Since 2005 SolarYpsi has been working to make Ypsilanti a “Solar Destination”, shining the way to a future filled with renewable energies. Hopefully this donation, which comes from outside the community, will inspire more residents and businesses in Ypsilanti to consider solar power.